“When my son came out to me, I was deeply fearful that he could never be happy. 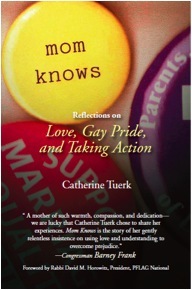 And I felt profound sorrow, almost as though he had died.” Thus began one woman’s extraordinary, silence-breaking journey: Catherine Tuerk set out to educate herself and others about gay people. She became a leader in PFLAG—Parents, Families and Friends of Lesbians and Gays. She wrote articles for varied publications and appeared on many television and radio shows with the aim of dispelling homophobia and promoting pride-inspired advocacy. On frequent vacation trips abroad, Catherine and her husband served as pro-gay ambassadors, getting to know gay people and their parents in other cultures. Concerned that the unique realities of gay and transgender children are often overlooked or ignored, Catherine was instrumental in establishing a pioneering program that supports and affirms gender-nonconforming children and their families. All along the way, Catherine Tuerk has been writing candidly about her journey. Mom Knows is a lively and compelling selection from her writings of two decades, with this remarkable mother’s distinctive voice—frank and insightful, compassionate and hopeful—coming through strong and clear.